This photo represents approximately 95% of the park. Enjoy. Welcome to the only diner open in Moab at Christmas. 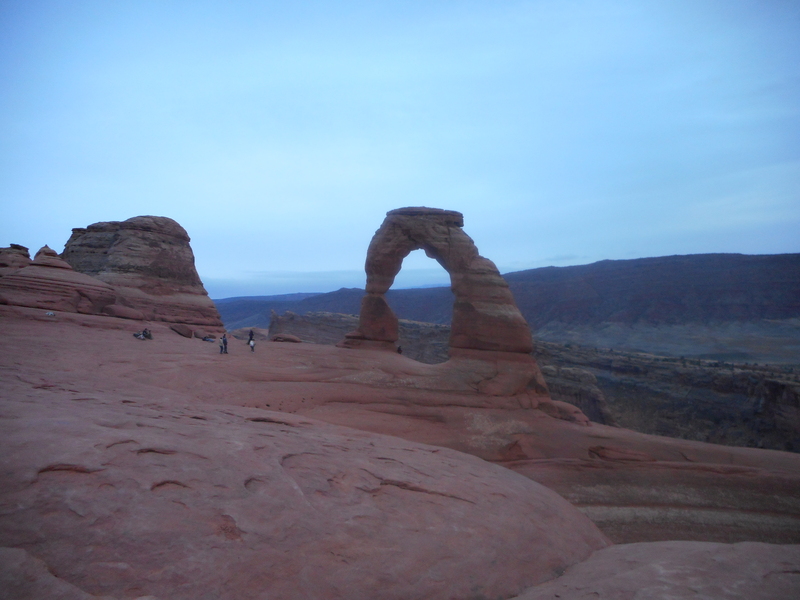 Despite having lived in Utah for the last 14 years, I had just plain never been to Moab or the Arches National Park. Since this was clearly a dramatic oversight on my part, I went ahead and planned a trip at Christmas to the area. 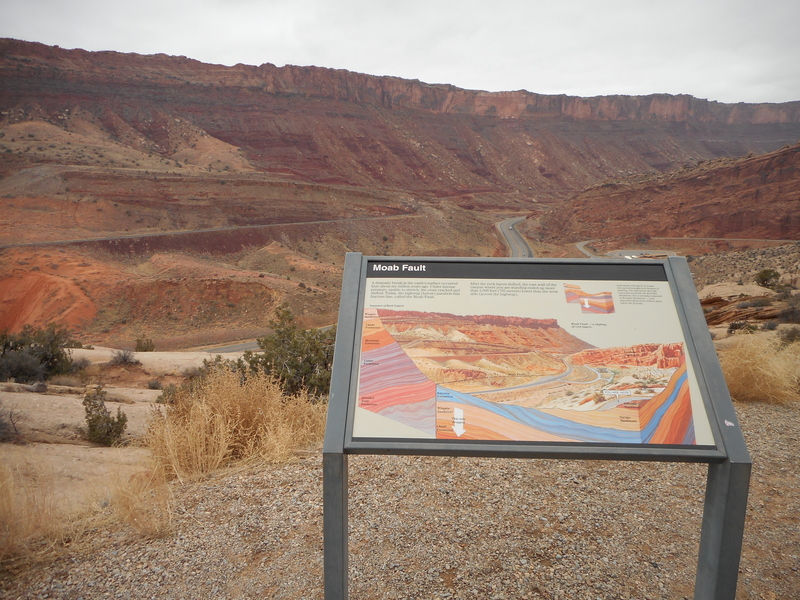 I’m not into four-wheeling, parachuting, hang-gliding, or pretty much anything beyond “brisk walking”, so it was all right that we were there off-season and everything (and I do mean every single damn thing) in Moab was closed. Cheap hotel, no crowds, and no oppressive heat melting me to the pavement. So anyway, this whole place is pretty cool. I could get into the geographical and geological principles that resulted in the formations in this park, but you know what? That’s what Wikipedia is for. Let’s just say that it was pretty awe-inspiring, as far as incredibly large, dramatic red rocks go. I will say that I was pretty impressed at how red everything was, and somewhat disappointed at how red everything was. My suspicion is that part of the problem was how cloudy and overcast the day was, and also the fact that we went in the evening on one day, and the early morning on the next. Then again, it could also be that the entire park is pretty red. So! There are cool rock formations in this park. You’ve heard of many of them and you’ve seen more. I seriously have nothing new to add here except here are some pictures I took. Sheep Rock. So named because it vaguely resembles a sheep to people who can’t tell that it CLEARLY is a chimp-cow hybrid. Balanced Rock. I was afraid to walk around underneath it JUST IN CASE today was the day that it fell. The Three Gossips. They’re probably talking about how little Sheep Rock actually looks like a sheep. There are wobbly-looking rocks perched precariously on top of other rocks, just everywhere here. Terrifying. Many of the formations can be seen from the road. By the way, while we’re talking about the road, it’s really long. Super long. I mean I knew coming into the park that it was long, but was still surprised at how long. Pictured: The majority of your trip to Arches National Park. 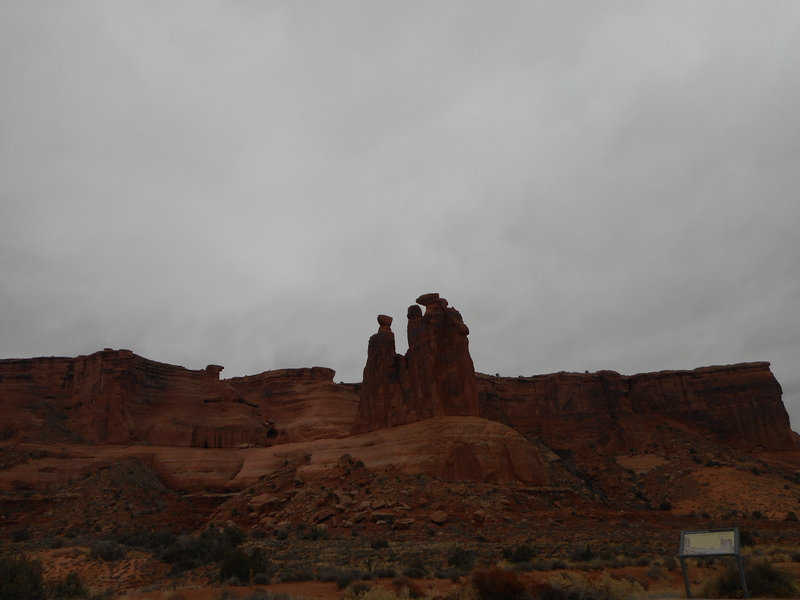 Anyway, some of the more popular formations are actually a pretty short walk from the road. 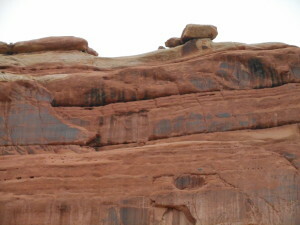 Balanced Rock, for example, is easily visible from the road and the trail is less of a “hike” and more of a “leisurely stroll”. 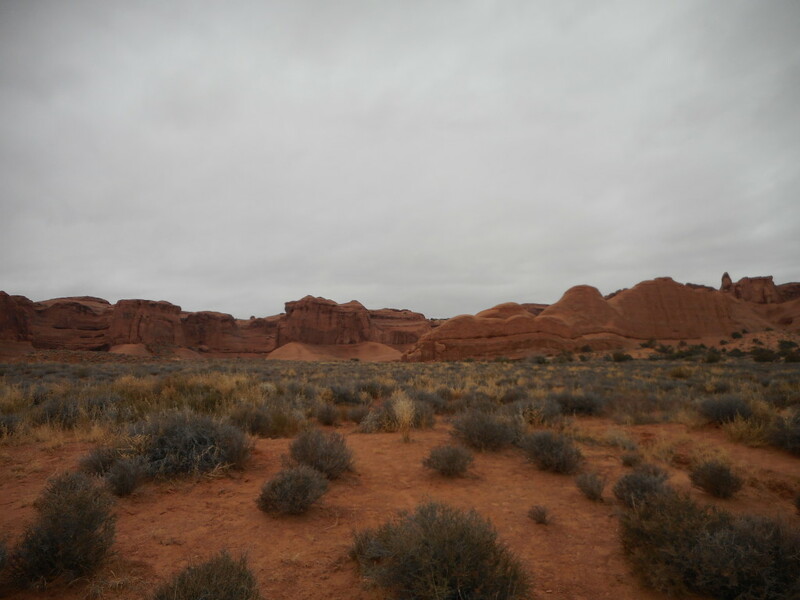 It’s also on the way to the famous stuff, like Landscape Arch and Delicate Arch, so we hopped out to check it out on the way. This was around the time that I started getting cocky about our trip. 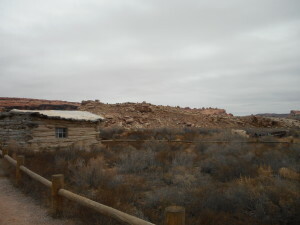 There was almost nobody for miles around – just two or three people, one of whom was a park ranger. Easy hike, cool rocks, no crowds. Good times! 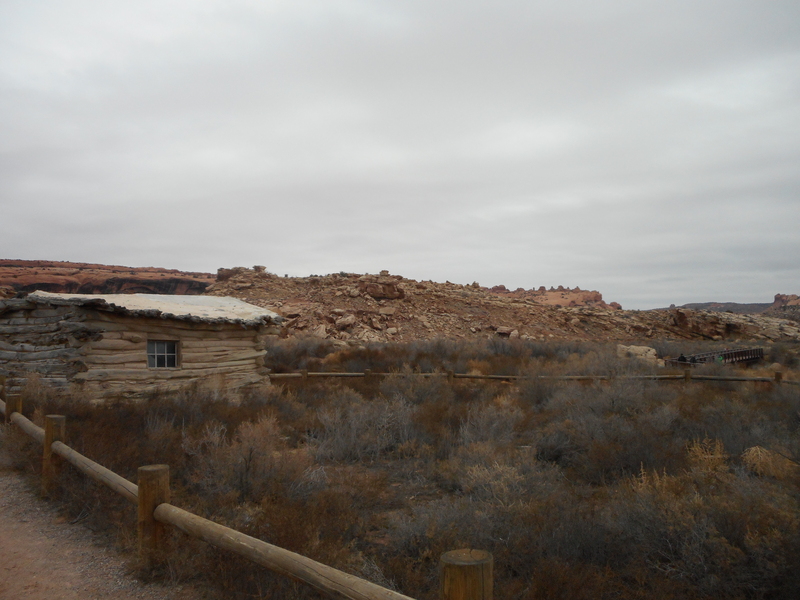 This spooky place is right next to the trailhead for Delicate Arch. There was a story about it that I didn’t bother to remember. Spooooooky. So we go to Delicate Arch, which I believe is legally required if you visit the Arches, as it’s on our license plates and billboards and souvenirs and letterheads and in logos everywhere and probably forcibly tattooed onto anyone elected to office here, I don’t even know, I’m just saying it’s freaking everywhere. I also assume it’s legally required by the fact that, despite there being literally nobody almost anywhere else in the park, the parking lot for the Delicate Arch trail head was packed and there were people swarming the area. Not Pictured: My will to live after hiking on this for an hour. The national park’s website listed the trail to Delicate Arch as “strenuous.” I laughed at this. It’s only like a mile and a half or something. I mean it sounds tiring, but not “strenuous.” I also heard that a lot of it was on the slick rock, which are basically petrified sand dunes that are huge and flat and have excellent traction, which said to me that they would be easy to walk on. I’m sure you can see where this is going well before I figured it out. Let’s just say I didn’t take into account the angle that this slick rock was at. So! A lot of sweating, swearing, and a few near-misses with cardiac arrest later, we finally got to the Delicate Arch itself. 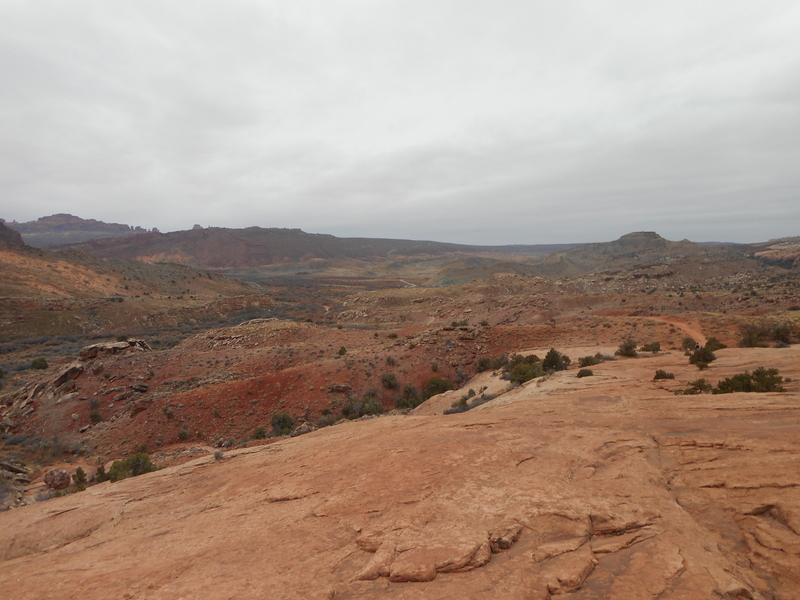 There will be at least a dozen times during the course of this hike that you will come around a corner, or up a ridge, utterly convinced that you simply MUST be there by now, only to find more and more slick rock, dirt, rocks, or sand. So be prepared for that part. But the point when you finally do get there is pretty epic. There’s this big dramatic reveal and it’s pretty cool and worth it. Plus, by the time you get there, those endorphins have kicked in and you’re pretty much having a great chemically-induced time. The whole reason you go to The Arches, right there. 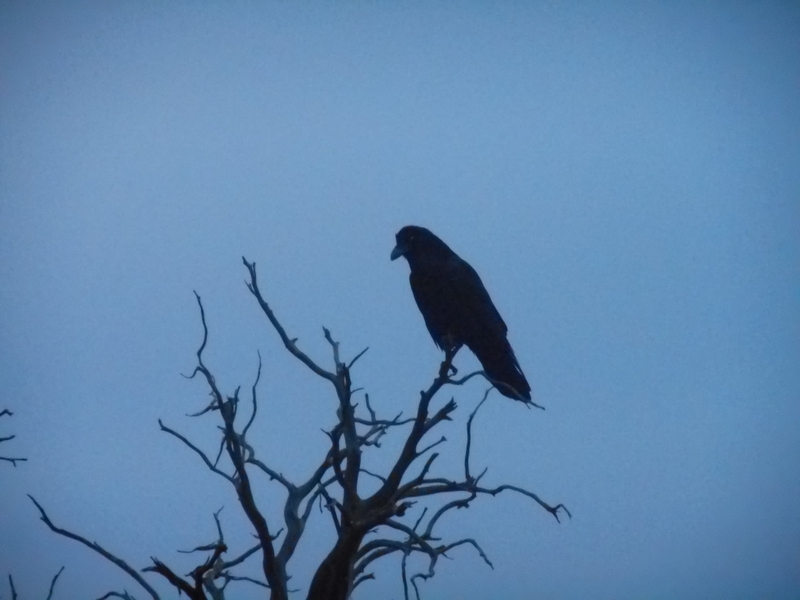 These were everywhere, and kept following us around while cawing ominously. I wasn’t the first out-of-shape tourist they encountered, if you catch my meaning. 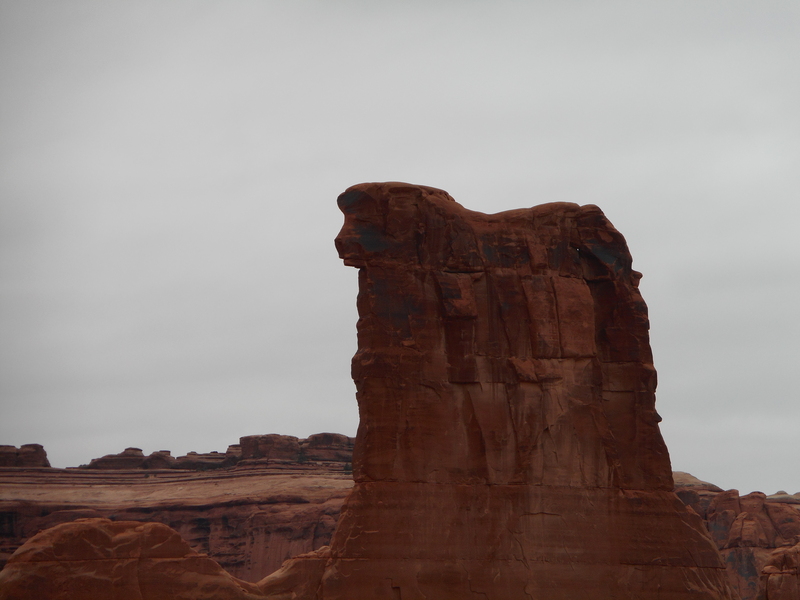 By the way, if you’ve never seen the Delicate Arch up close, you’re missing out. It’s tough to describe how I guess majestic? it is. Actually that’s a pretty good word. It’s majestic. 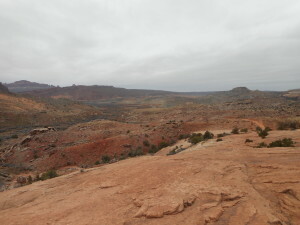 After that dramatic realization that I was far too out of shape to even pretend to hike to any of the other interesting monuments, we just drove the loop, waved at more arches from a distance, talked about how we would totally come back and hike “in the future sometime, maybe in the spring” and then left. Also, I saw a deer. So keep your eyes open, you might see a deer too. We actually did come back the next morning to check out the North and South Windows, with the caveat that we would absolutely not walk all the way up if it turned out there were simply too many stairs. It ended up okay. We took some pictures. 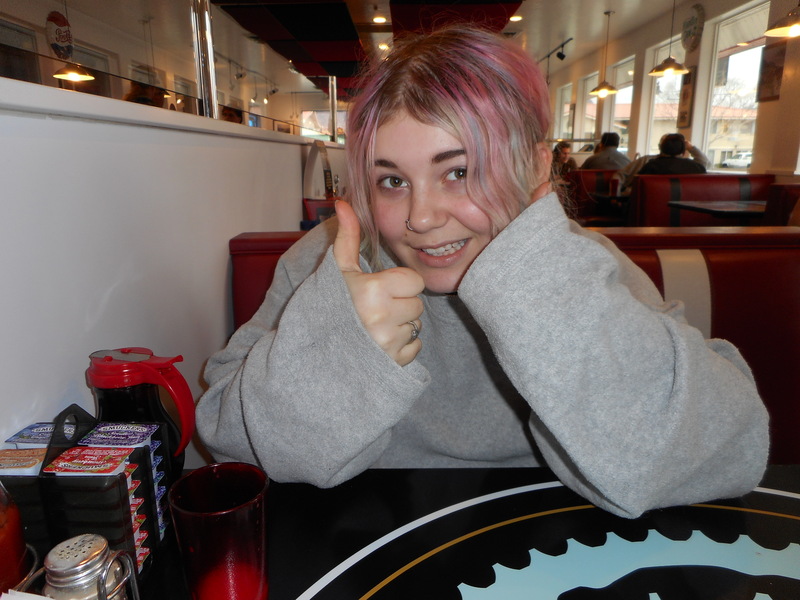 It was pleasant. Except for the crows following us and giving me flashbacks to The Stand, anyway. So, like, if you want to walk over to the Windows, they’re okay and not too far from the road. Someday I really will go back and hike over to Devil’s Garden or something. I will. Really. Well, this one ain’t hard. 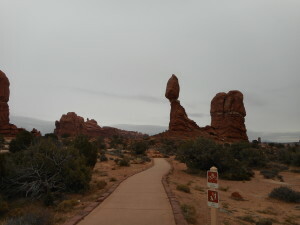 Check out the National Park Service site for the Arches. I mean, if I have to give you directions to this place, then it’s almost like you don’t deserve to go there at all.